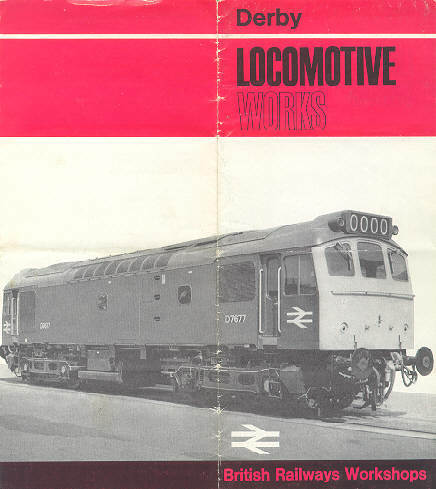 D7677 features on the cover of a pamphlet issued to visitors at Derby Locomotive Works during the late 1970s. The sixteen year nine month career of D7677/25327 was spent allocated to London Midland & Western Region depots. Dual brake equipped (October 1977). Time between last Classified repair and withdrawal: 74 months. Time between withdrawal & scrapping: 49 months. July 1971 to Ebbw Junction (86B) on loan, made permanent August 1971. 25327 was the 214th Class 25 withdrawn, the only Class 25 withdrawn during February 1984. After withdrawal 25327 was stored at Carlisle Kingmoor, then moved to Crewe Diesel depot during June 1984, remaining here until April 2nd 1985 when it moved to Swindon Works. However the Works closed prior to scrapping, on June 3rd 1987 25327 was moved to Cocklebury Yard, then to Leicester Humberstone Road on June 4th 1987 and into Vic Berry's yard on June 5th 1987. By October 1987 25327 had been placed in the stack, by the first week of March 1988 the locomotive had been removed from the stack and broken up, with the exception of the cabs which lingered until May 1990. Movement: March 26th - April 2nd 1985: 25251/284 & 25327 Crewe - Swindon. Movement: June 4th & 5th 1987: 25161, 25207/208, 25327 Cocklebury Yard - Leicester. Photograph courtesy Gary Thornton. 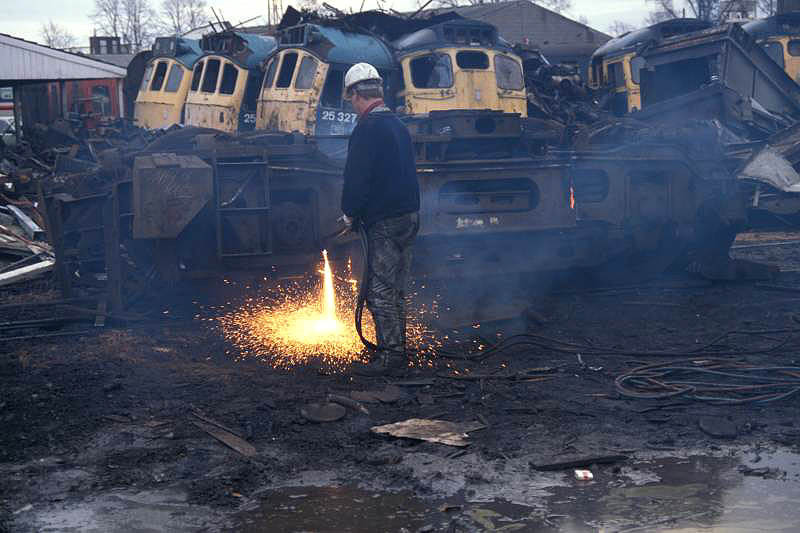 To the background of several Class 25 & 27 cabs (including 25327), a bogie from a Class 25 succumbs to the cutters torch on March 5th 1989. Noted Derby Works February 1972. Noted Derby Works September 1977 - November 1977 (Classified & dual brake equipment fitted). Noted Derby Works November 1979 (Works arrival siding?). June saw the frames laid at Derby for the last batch of Class 25s, D7660 - D7677, under order number 11001. These were part of an order given to Beyer Peacock but their worsening financial position led to the company asking for a release from the final eighteen machines. D7677 was delivered to the Nottingham Division (D16) during May, being delivered to traffic in blue livery with full yellow ends. D7671 - D7677 were transferred to Carlisle (12B) during July, as part of the manouevring of the diesel fleet to eradicate steam in the north west. D7677 was noted at Carlisle on the night of July 22nd replacing 45212 on an overnight Morecambe - Stranraer relief. The 27th saw D7673 & D7677 replace 45137 & 44983 on the 08.20 Birmingham - Perth. D7677 appeared again on August 12th in charge of 11.25 Newcastle - Llandudno, from Carlisle?. In February D7671 - D7677 were moved to Carlisle (12A), then in May D7674 - D7677 headed south to Longsight (9A). On August 31st 7677 & 7539 worked the 09.35 Sheffield - Llandudno Town and the return 14.28 Llandudno Town - Sheffield. The Liverpool Division (D08) received 7675 - 7677 in November. Photograph courtesy Steve Jones. From the files of "Old Buffers" comes this fine black & white view of D7677 on a very familiar scene from the early 1970s. Although the view is undated it seems likely the view is taken after a Works visit. Compared to the first view on this page the numbers are now on the cab side, without the 'D' and the repositioned BR symbol. In a reshuffle of power to assist in the removal of the hydraulics on the Western Region 7677 moved to Newport (86B) in July. By October 7675 - 7677 were transferred to Laira (84A). On March 13th the 20.10 Exeter St. Davids - Newton Abbot was worked by 7677. On April 19th 7677 worked the 20.10 Exeter St Davids - Newton Abbot. Later that evening 7677 was added to the 18.00 Penzance - Bristol Temple Meads with D1059, the Class 25 working as far as Exeter St Davids. 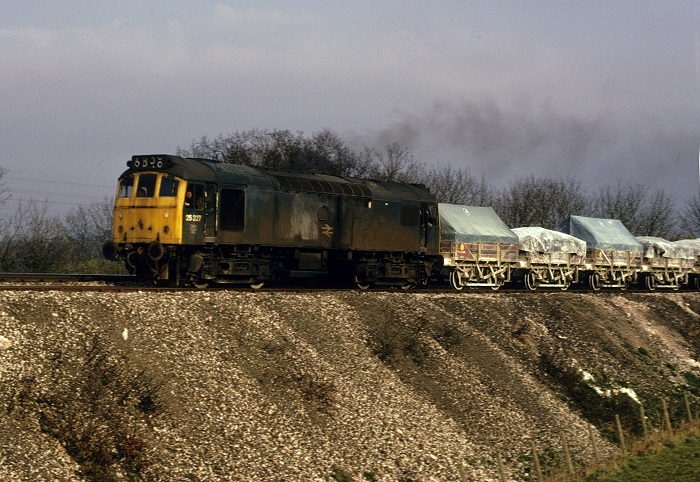 On May 31st Class 52 No.1026 & 7677 were noted eastbound at Saltash with empty ballast hoppers for Stoneycombe quarry. The 20.15 Exeter St Davids - Newton Abbot was worked by 7677 on June 22nd. 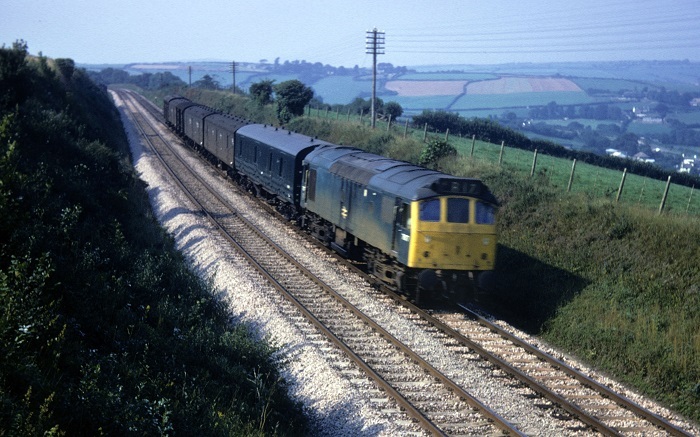 Photograph courtesy Roger Geach With a fine collection of parcels vans in tow, 7677 passes Moorswater with the 4B17 Penzance - Bristol Temple Meads parcels on September 8th 1973. On October 6th a Barnsley - Barnstaple day excursion was worked roundtrip Exeter St. Davids - Barnstaple by 7677 & 7676. Class 47 No.1624 worked the train north from Exeter. Photograph courtesy Roger Geach Here is 25327 on March 20th 1975 with the Moorswater to Fowey clay about a mile out of Liskeard on its way to Lostwithiel. The clay from Moorswater would normally be shunted into the yard at Lostwithiel and tripped to Fowey later that afternoon attached to a load from one of the other locations. 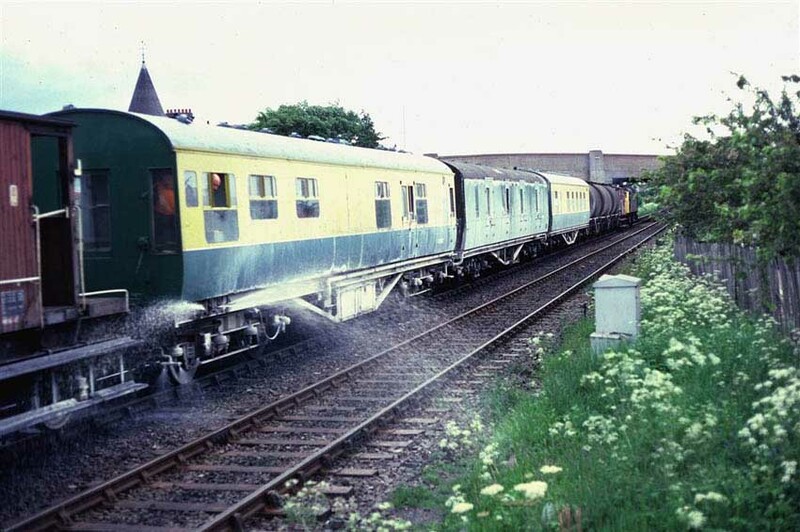 The Class 25 would then head light back to St Blazey. Occasionally the Moorswater might go to Fowey directly. On August 11th the 11.55 Paignton - Paddington failed at Taunton East behind Class 52 No.1037 failed, 7677 dragged everything to Paddington. 25326 & 25327 headed north to Crewe in August. A short lived summer diagram involved the 07.19 Bangor - Manchester, the 12.42 back to Llandudno and the 18.40 return to Manchester, then empty coaching stock to Bangor. Most frequently in the hands of a Class 40, 25327 worked the diagram on August 25th. On September 10th the 14.30 St. Pancras - Derby was worked by 25327 & 25267. 25327 was stabled at Cockshute on July 3rd, with very faded paintwork on the No.1 cabfront. 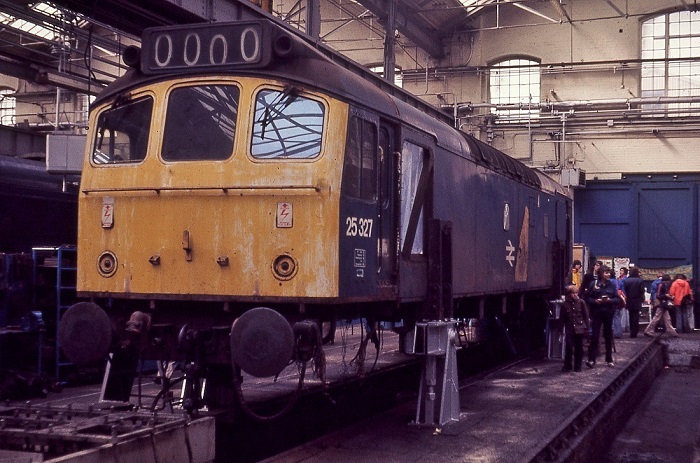 A view of 25327 at Derby Works on September 10th 1977. 25327 was under repair at Derby during October & November, the latter month also seeing 25325 at Derby. On May 28th 25327 & 25305 worked the 08.45 Birmingham New Street - Barmouth and the return 17.45 Barmouth - Euston to Wolverhampton. On June 19th the 13.35 Glasgow Central - Taunton was worked from Birmingham New Street to Bristol Temple Meads by 25327, being replaced at Bristol by 46048. On August 12th the 04.15 Shrewsbury - Aberystwyth and the 10.07 Aberystwyth - Euston to Wolverhampton were worked by 25327 & 25277. 25327 was noted at Chinley with a westbound loaded ICI working on June 19th. On July 7th the 10.10 Euston - Aberystwyth from Birmingham New Street and the 16.10 Aberystwyth - Shrewsbury were worked by 25327 & 25259. The next day (8th) the same pair were noted at Birmingham New Street on an unidentified passenger working. 25327 was stabled at Shrewsbury on April 19th. 25327 received an 'E' examination at Tyseley during May. 25327, 25315 & 45120 were noted light engines passing Cudworth on June 3rd. On July 5th the 04.10 Shrewsbury - Aberystwyth and the 10.07 Aberystwyth - Euston to Wolverhampton were worked by 25327 & 25277. A week lated on July 12th the 07.40 Euston - Aberystwyth from Wolverhampton and the 17.55 Aberystwyth - Wolverhampton were worked by 25327 & 25283. On October 30th the 06.55 Gloucester - Birmingham behind 37180 stalled near the top of Lickey incline. The following Stoke Gifford - Redditch stone train with 25264 & 25327 & banked by 37208 & 37231 were called up to assist in the rear. 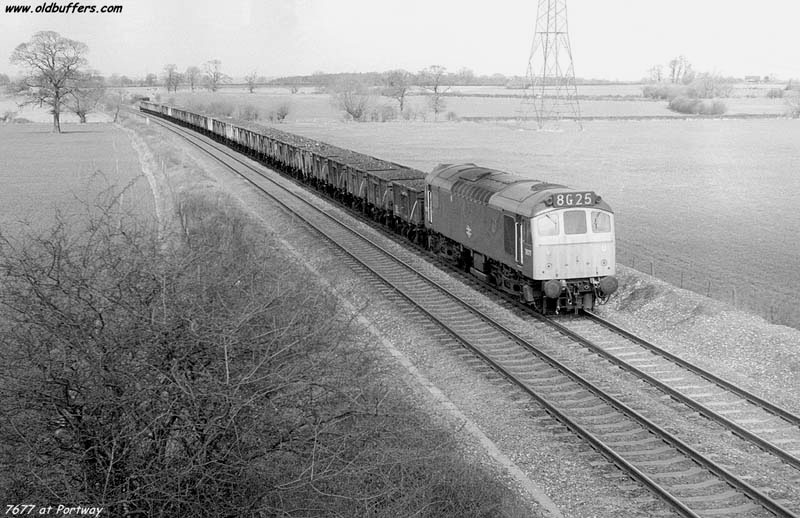 This stone train was only one of two scheduled double headed workings over Lickey, normally operated by Class 25s, the other working a Port Clarence - Bromsgrove oil train used pairs of Class 31s. On May 4th the 17.30 Aberystwyth - Manchester Piccadilly day excursion return leg was worked by 25327 & 25071, 25080 had failed and been replaced. During June 25327 found itself commandeered to handle the weedkilling train on the Inverness - Aberdeen line. Photograph courtesy Norman Smart. A long way from its home depot during June 1981, Elgin station is the location for 25327 hauling a weedkilling train. Photograph courtesy Norman Smart. As the train pulled away from the station the spraying equipment restarted. It looks like the newest vehicle in the whole train might be the locomotive. On August 24th the 10.15 Birmingham New Street - Norwich and the return 15.32 Norwich - Birmingham New Street were worked by 25327. The 08.40 Carlisle - Glasgow Central was worked by 25327 on September 11th. A Gillingham - Sellafield nuclear fuel train was noted at Wellingborough with 25327 on November 17th. 25327 was stabled at Severn Tunnel Junction on January 30th. On March 13th a Leamington Spa - Nelson day excursion return leg was worked by 25327 & 25224 from Leamington Spa to Preston. 25327 was stabled at Saltley on March 26th. On April 16th 25327 had charge of a rake of HEA coal hoppers when noted passing Sutton Park. 25327 & 25306 were noted at Peterborough with a mixed freight on May 20th. 25327 worked a North Wales coast Saturdays only diagram on June 26th handling the 09.44 Llandudno - Manchester Victoria, then the 13.45 to Bangor and the 16.52 return to Manchester Victoria. On July 19th 25327 worked the 17.37 Llandudno Town - Stoke-on-Trent. On August 1st 25327 worked the 09.50 Manchester Victoria - Llandudno Town and the 14.20 Llandudno Town - Manchester Victoria. On the early morning of August 19th 25327 worked a Manchester Victoria - Barrow-In-Furness parcels. On December 12th the 21.24 Bristol Temple Meads - Glasgow Central with 86006 was assisted between Wolverhampton & Crewe by 25327 & 25324 due to the power being off for engineering work. 25327 was stabled at Manchester Victoria on February 5th. 25327 was stabled at Rugby station on February 26th. On July 2nd 25289 & 25327 worked the 07.35 Euston - Aberystwyth from Wolverhampton, returning with the 14.00 Aberystwyth - Shrewsbury. A week later on July 9th 25297 & 25327 were running late on the 7.44 Shrewsbury - Aberystwyth, so much so that the journey terminated short at Machynlleth, starting the return 1A46 to Euston from there. On the last summer Saturday of the season, September 17th, 25265 & 25327 worked the 10.10 Euston - Aberystwyth forward from Birmingham to Shrewsbury. Two days later (19th) 25327 worked the 16.06 Crewe - Cardiff after 33018 failed. 25327 with a nuclear flask train was noted northbound at Charnock Richard on August 5th. 25327 was noted southbound at Preston with a two wagon freight on August 9th. 25327 was the Manchester Victoria pilot on August 20th & 22nd. 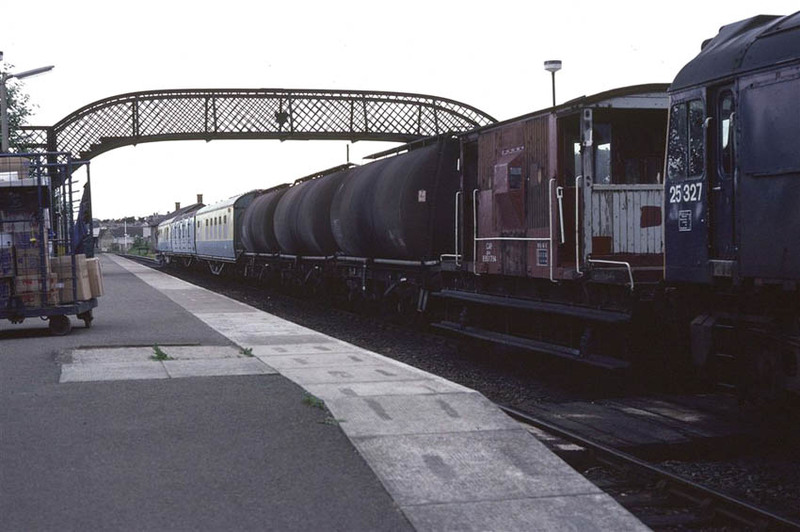 On October 11th 25327 & 25285 were noted southbound at Warrington Bank Quay station with a train of empty 16 ton mineral wagons. 25327 & 25296 were noted light engines at Warrington Bank Quay Low Level on December 5th. The 14.48 Preston - Liverpool Lime Street was worked by 25327 on December 18th. 25327 & 25311 were noted northbound at Warrington Bank Quay with bogie oil tankers on December 29th. 25327 was withdrawn on February 2nd 1984. No.2 cab: no centre lampbracket or other fittings: June 1978 until withdrawn. No.1 cab front: two rust patches below center window: (not present June 1980), March 1982 until withdrawal. No.1 cab front '25327' scrawled on front: August 1982. No.1 cab 2nd man's side: unpainted side window frame: June 1980 - August 1983. Last updated Febrary 16th 2019.